Michael Connelly, author of the Harry Bosch and Lincoln Lawyer series, never disappoints his readers. The consistent quality of his mysteries is guaranteed. 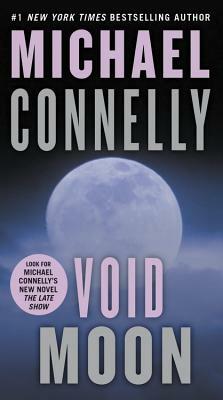 Void Moon is a stand-alone mystery and it's my personal favorite. It features Cassie Black, who is not a cop or a lawyer, but an ex-con with a secret, which propels her back into a life of crime for one last score. Unfortunately, her successful heist is a little too successful, relieving the mob of 2.5 million dollars. They don't take kindly to their loss and send killer Jack Karch after Cassie in a pursuit that will keep you turning pages late into the night. In L.A. Cassie Black is another beautiful woman in a Porsche: except Cassie just did six years in prison and still has "outlaw juice" flowing in her veins. Now Cassie is returning to her old profession, taking down a money man in Vegas. But the perfect heist goes very wrong, and suddenly Cassie is on the run--with a near-psychotic Vegas "fixer" killing everyone who knew about the job. Michael Connelly is the author of twenty-nine novels, including #1 New York Times bestsellers The Wrong Side of Goodbye and The Crossing. His books, which include the Harry Bosch series and Lincoln Lawyer series, have sold more than sixty million copies worldwide. Connelly is a former newspaper reporter who has won numerous awards for his journalism and his novels and is the executive producer of BOSCH, starring Titus Welliver. He spends his time in California and Florida. "Michael Connelly is one of those masters...who can keep driving the story in runaway locomotive style." "The best mystery writer in the world." "Connelly is raising the hard-boiled detective novel to a new level...adding substance and depth to modern crime fiction." "Ambitious, skillful, moving, intricate, and clever."